Guitar World is a monthly music magazine devoted to guitarists, published since July 1980. It contains original interviews, album and gear reviews, and guitar and bass tablature of approximately five songs each month. The magazine is published 13 times per year (12 monthly issues and a holiday issue). Formerly owned by Harris Publications, Future US bought the magazine in 2003. In 2012, NewBay Media bought the Music division of Future US. 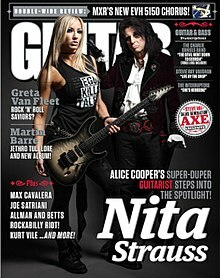 The latter company also published a spin-off title, Guitar Legends, each issue of which typically combined past articles from Guitar World under a specific theme. The first Guitar Legends was on Eddie Van Halen. In 2018, Future acquired NewBay Media, returning Guitar World to Future US. ^ "eCirc for Consumer Magazines". Alliance for Audited Media. December 31, 2012. Retrieved July 4, 2013. ^ "PennWell Corp. and NewBay Media Acquired By UK Firms". Folio:. 2018-04-04. Retrieved 2018-09-01.